Have you ever looked into the woods and seen a face looking back at you made up of branches and leaves? These are the moments that can’t be caught on film but can be evoked through tales, through our own folklore. Turning the pages of the Urban Green Man collection is like opening a window from a stagnant urban environment into a verdant treescape filled with life, reflection, and the potential for change. These are transformative tales, tales of growth that evoke fertile thoughts and development in the reader as she or he touches these pages that used to be trees themselves. These pages are trees with stories written upon them, inked with potential. Each page sings its papery roots. Like growing things, like the forest itself, characters in these tales change and reach toward illumination, shifting with new potential. The stories in this collection explore the lighter and darker shades of green, bringing the reader both into the dark places of the forest where fear and danger evoke speculation and to the treetops where flights of fancy free him or her from their bounds. The authors explore the complexity of human interactions with the natural world and the interconnectedness of humanity and our green spaces. 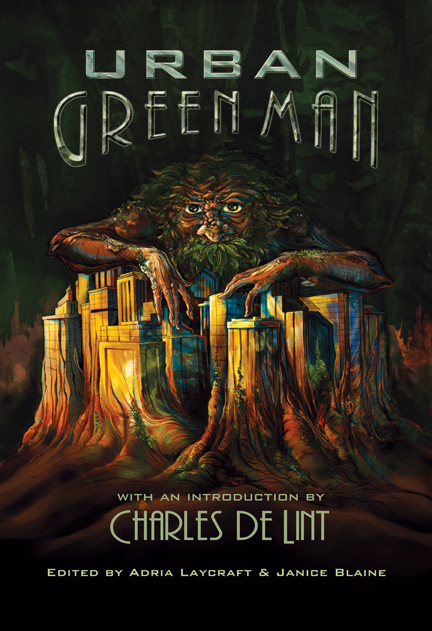 Urban Green Man writes a mythic modernity, a set of tales to help us explore the world around us and our own impact on that world. It is a reminder of the hollowness of human nature without… well, nature. The Green Man’s face is so reminiscent of our own and yet so different, evoking our connection to the world and our simultaneous estrangement from it. His face is uncovered through the leaves of these pages. This entry was posted in Fiction Book Reviews and tagged Adria Laycraft, change, Edge, environmentalism, estrangement, Green Man, human relationship to environment, Janice Blaine, literature for social change, nature, reflection, reviews, trees.